A Catio as Special as Your Cat! At Catio Spaces we value the role cats play in our lives. 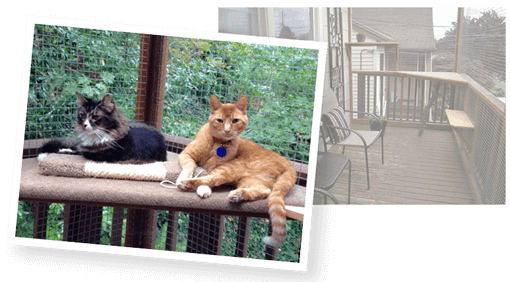 Our goal is to keep your cat safe and happy in a catio, an outdoor cat enclosure, that complements your home and suits your feline’s fancy! For simple to sublime, we design and build custom catios for a variety of outdoor spaces including a window, patio, deck or yard. Experienced in working on a variety of home improvement projects, we’re known for our positive energy and creative solutions for our 2-legged and 4-legged clients. 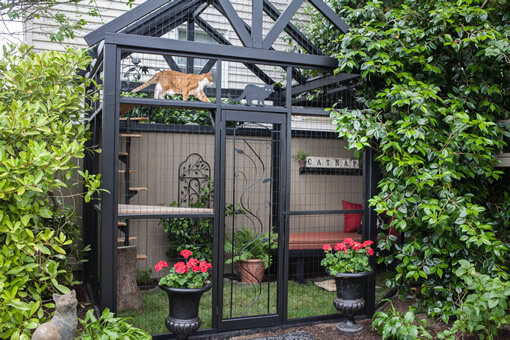 Beginning with our initial meeting to the moment your cat steps into your custom catio, we’ll work with you to create an outdoor space both you and your cat can enjoy. The process starts by meeting you (we love cat people!) and of course, your cats, to learn their personalities and any special needs. We’ll review potential catio locations, cat access and discuss design ideas. We’ll also show you samples of wood, wire and roofing materials. Our goal is to get a clear understanding of your catio project. After our on-site consultation, we will provide an estimated cost of your catio within approximately 7 days. Once you give us a “paws up” for the project, a 50% deposit is due upon signing a purchase order and the balance is due the day the catio is completed. Once the estimate is approved, we’ll schedule the build date(s), order materials and deliver materials (typically 1 day in advance of the catio build). Our carpentry crew will then be onsite to build a custom catio for you and your fur family to enjoy! We’ve had several window watching fur clients take on the role of “construction supervisor” and tell us to hurry up! We look forward to meeting you and your fur family!